Child friendly? : As you might expect from a Dreamworks animated feature, this film does not include anything that would be overly concerning to fathers. There are hints of jungle-related violence – such as hunters and animals fighting – but it is no more frightening than what has been included in past movies of this genre, including the Lion King. 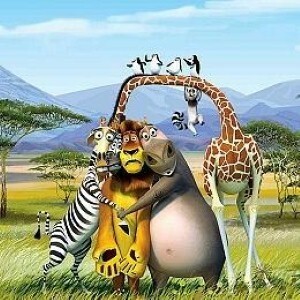 The Madagascar sequel picks up where the first movie left off, featuring Alex the lion, Marty the zebra and Melman the giraffe embarking on a new adventure. Fathers may notice that the plot of the second film does not depart radically from its predecessor – and this very familiarity could be what children end up enjoying. The group is on its way home to the New York Zoo from Madagascar, when the plane winds up crashing in the African savannah. This allows us to learn a bit more about Alex’s story, as he is reunited with his father, Zuba, and gets a chance to explore his roots – and meet the evil lion Makumba who dominates the tribe. While the central plot unfolds, the secondary characters provide plenty of fast-paced laughs, based around a mix of slapstick and pop culture references. The same song from the first installment – Move it, Move it – provides a toe-tapping soundtrack for the animals’ antics. Expect it to be stuck in your head for the entire week following your viewing. So far, children’s reactions to the newest Madagascar film seem to be ebullient and enthusiastic without reservation, while parents admit they enjoyed the ride as well.